Attention!! Sometimes our swims are cancelled or moved to a different location. Please check our calendar events page and our announcement widget in the right column for the latest information regarding our swims. Location: Templeton Pool, 700 Templeton drive, Vancouver. Cost: Regular admission is $9. NIFTY offers half price swim rates to students and low income people. Children (18 years & younger) are admitted free when accompanied by their parents. Annual membership (by donation, $0 and up) required for all adult admissions. 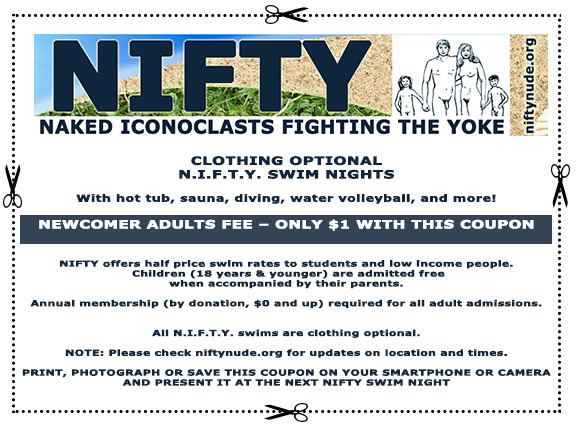 Attention Newcomers: Your first NIFTY swim is only $1. Please click on the image below, print, photograph or save the discount coupon on your smartphone or camera and present it at the next NIFTY swim. We accept the coupons on paper, digital cameras and smartphones. Following each swim night there is usually a get together for snacks at a local restaurant. Check with the front desk for location. All N.I.F.T.Y. swims are clothing optional.